To add a new customer in QuickBooks, first go to the "Customer Center" and then at the top click the "New Customer & Job Button" followed "New Customer". Fill out the customers info using the picture below as a guide. *NOTE* Make sure the customers service address is in Shipping Address Line 2. After clicking OK on the previous window to save the customer, we should see the new customer in our QuickBooks Customer List. 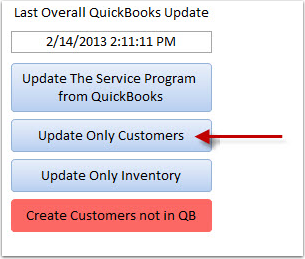 Click on the Update QuickBooks icon on the toolbar in The Service Program. On the QuickBooks Maint. 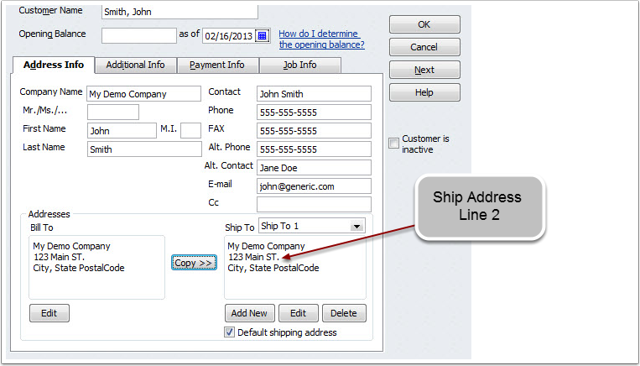 Menu, click update only customers to have The Service Program sync over the new customer we just created. 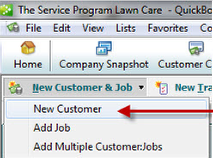 We then can click customer info and then customer list in The Service Program and make sure the new customer was added correctly.